Just like ’buses, they all turn up at once! This one, published in Heritage Daily, an independent online academic magazine, dedicated to the heritage and history of the world, appeared today. 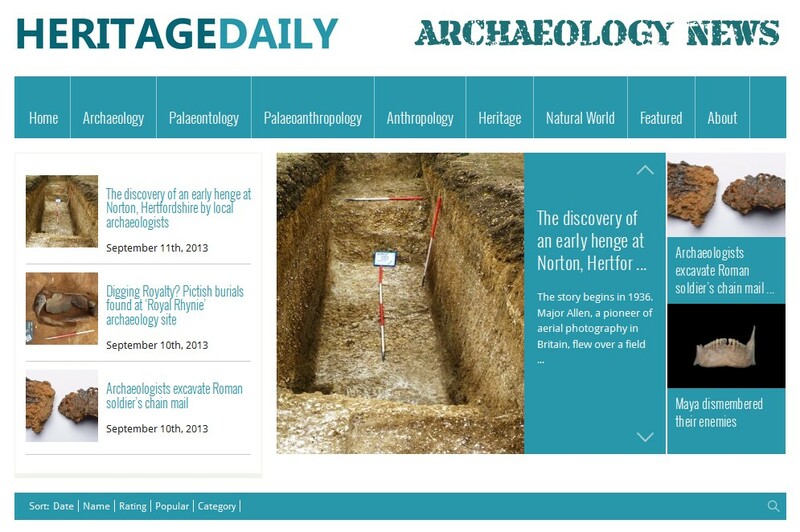 It is completely up-to-date and, for the first time, publishes a proper plan of the excavated henge in relation to the geophysical survey results. We are spending this morning tying up loose ends. Emily and Jim are trying to remove the last of (29), which can now be seen to overlie the surface (355); (97) turns out to be on top of (29) and to have spilled partly down into the inner ditch from the hump it forms that can be seen in section on the north-western edge, where it overlies (355) as (29) does not extend this far in that direction. Steve and Nigel are finishing the excavation of the westernmost of the three pits in the entrance, . Lyall and Ivor are drawing a profile across pit  after emptying the water that had collected inside it overnight. Phil and Martin are completing the excavation of the inner ditch, . Chris and Rick are drawing the north-east facing section of outer ditch , having spent some time with Keeley, Ivor and Lyall baling out the water that had filled it to a depth of around 15 cm. Keeley and Frankie are wrestling (sometimes literally) with paperwork and plans. I am beginning to wonder about the fills of these pits. They all appear to have been infilled deliberately with very rammed chalk in a sandy clay matrix, compressed so much that they have been very difficult to excavate. Given the way that all three pits have been filling with water after rain, they must have posed an inconvenience to the users of the henge; even once they were full with soil (assuming that they ever were), they would have presented horrible soggy puddles in wet weather. I suspect that their fills were created in an attempt to minimise the puddling in this area. Everything is really coming together today. Excavation has been minimal and most people have been occupied with recording. The sections across the outer ditch were completed before lunchtime, although there is still a little bit of cleaning to be done in the earlier ditch that was cut by it, as I need to get a photograph specifically showing it. Paul has planned the hollows east of the centre of the henge (we have decided not to assign them context numbers as they appear to be worn hollows in the bedrock), Steve is planning pit  and work has begun on recording both east facing and west facing sections of inner ditch . The sections across the inner ditch show very clearly the cutting back of the bank when the inner ditch was created, so the sections have been extended back into the bank area, with the west facing section going across into the pre-henge topsoils. We have sufficient data from different sections to create a composite section across the entire henge. This is amazing! My concerns about barrows and misinterpreting the site have all vanished and I am now quite clear about the sequence. If anything, the low bank formed by (97) turns the site into a pond barrow for its final phase… Does this imply a connection between formative henges, classic henges and pond barrows? By lunchtime, Paul had finished recording, so after lunch, he started to lay the first strip of geotextile, beginning in the southern corner of the trench and working north-eastward, covering the house, . As other people finished their work (Rick in the outer ditch, Emily and Jim on (29), Lyall on his section), they each started help with removing soil from the spoilheaps, barrowing it across the site and leaving small mounds to secure the geotextile whilst waiting for the mechanical digger to come and do the backfilling proper. As ever, there are unstratified finds turning up in the spoil. We held a little ceremony at the cremation pit . Frankie had brought in a piece of rose quartz and a bag to hold it, which was accompanied by a waterproof label with a bit of text I wrote about the circumstances of the excavation of this pit, which went into a waterproof bag. Although it all seems a bit New Age and hippyish, everyone on site came and stood round while Frankie deposited it. Should we record this as a gift for the ancestors? The last recording to be done was the planning of ditch  by Paul, who has turned out to be the fastest and most accurate planner on site. He was a member of the first team to work on the uppermost deposits in the feature, so it seems entirely fitting that he should be the one to draw its post-excavation plan. I’d like to record a massive thank you to everyone who has worked on site for the past our summers, in whatever capacity and at whatever level of experience and ability: it is your hard work that has made this project what it has become. The end of an excavation is always an emotional moment, but this year is particularly so. We will not be returning to the henge in the foreseeable future and I will not be digging next year, for the first time since 1986. My time will be taken up with work on the new District Museum, due to open in March 2015, while it is up to members of Norton Community Archaeology Group to decide where they want to excavate next. They will have a hard time finding a site as wonderful as this one has been. It’s a stressful day: preparation for the Open Day in the rain and on the penultimate day on site do not make a good mix. Add to that the fact that I forgot to bring the camera to site this morning and had to go home to collect it means that I am not feeling especially happy. While I was off site, there have been some decent finds: a utilised flake (from the bottom of the inner ditch), a very nice arrowhead and a rimsherd of collard urn with impressed cord decoration (both these from (29)). The main fill of the inner ditch has gone completely; there appears to be an earlier silt along the southern edge, (402), that will need to be removed and the northern edge needs some work before we can consider the feature complete as there seems to be a similar (perhaps even the same) deposit here.. The weather really is quite dismal, but it is a Bank Holiday weekend, after all! To try to be positive about it, the visibility of deposits on site is excellent, which has allowed Chris and Rick to identify a posthole cut into the fills of the outer ditch, probably during the Roman period. Unfortunately, this has also removed the relationship between the henge ditch  and the fill of the earlier ditch on the same line, (307). As a result, they are having to remove the rest of (307) to reveal the relationship on the opposite side of the trench. Frankie is performing the invaluable task of checking context records. This will enable us to rectify any anomalies and omissions before we close down tomorrow. It really is our last chance as there are no plans to return to the site. I was unable to spend any time on the blog after midday owing to the time spent preparing for the open day. It’s always disruptive but it’s an important—even essential—of what Community Archaeology is all about. It helps get across the message that we have spectacular and important archaeological remains, even if they are invisible because they are under the plough. The rain continued throughout the day, even getting heavy after about 3 o’clock. We were all very damp by the time we left, around 4.30. Having missed two days on site, I feel very out of touch with what’s going on and can now sympathise with those who are only able to dig occasionally: reading a blog about the excavation is no substitute for being here. That said, there have been no new amazing discoveries apart from the way that (306) has turned into a cremation burial pit. That was completely unexpected; it also contained the remains of two separate infants. This site becomes more and more intriguing! Where William was cleaning the deposit, (307), at the edge of the outer ditch yesterday, he seems to have revealed a shallow ditch cut by the henge ditch. This might be related to the Middle Neolithic activity that preceded the henge (Mike Parker Pearson was quite happy to see it as domestic: he referred to our complete structure, , as a “house”, which is gratifying to hear), perhaps enclosing the site. Is it beyond the realms of possibility that the formative henge was preceded by a causewayed enclosure? We have only this one little bit of pre-henge ditch, but the profile looks right for one. Ursula’s hollow is beginning to look more pit like. This is good, as it means that we have three of the six pits that appear to line the entrance of the henge, showing as anomalies on the magnetometer survey of 1994. What it does mean that my idea that they might have been massive posts is wrong, as each is different in character and none has held a post. Ursula’s contains burnt chalk, something that I haven’t spotted elsewhere on site. In the centre of the henge, Bernie and Emily have now almost removed (29) and (355) is beginning to show through beneath it. On the eastern side of the section they are excavating, (355) definitely rises up to meet the chalk bank, (97), but to the west, there is no trace of it. It looks almost as if this part of (355) was cut away before the formation of (29); might it have been intended as a posthole, like  to the east, that was accidentally overdug? In this area, (29) definitely continues up to (97) and the interface appears to be vertical. In the inner ditch, Kit has found another piece of worked bone (more precisely, tooth) that makes it only the second bone artefact from the site, although now that I’m alerted to their existence, it will be worth scanning the rest of the animal bone to see if any more of it is worked. It’s an incisor whose root has been cut to form a point; there is also polish on the surface by the enamel. It may have been used as an awl or, more tentatively, as a tool for decorating pottery with dots or incisions. Mike Parker Pearson’s visit yesterday was both timely and reassuring. He commented that the outer ditch has exactly the same proportions as the ditch at Stonehenge, confirming what I had previously suggested. A ceramic type that had been puzzling me (it has cord-impressed decoration that made me think of Peterborough Wares but lacks the heavy flint tempering that is characteristic of it) he identified as Collared Urn: it’s only found in the latest deposits on site, confirming that we have activity after 2200 BC. He also confirmed that Grooved Ware can be made in a shell-tempered fabric. The base of the cremation deposit, (394), consists of a mass of cremated bone that is clearly adult in character; there have also been some barely burnt and very thin child skull fragments, including a piece with unfused sutures. As a burial pit, it is quite distinct and is almost precisely in the centre of the monument. The issue of its stratigraphic position is currently a bit unclear. It evidently cuts (355), unless our original impression that its top was more domed than flat is correct and it stood proud of the chalk rubble surface. Its location was almost certainly known when chalk platform (88) was constructed above it (unless this was placed in the centre of the henge with no knowledge that there had previously been a burial there). The section of the inner ditch in the L-shaped section has a completely different profile from the section started in 2011, cut . It is much more V-shaped, whereas the first section was more of a flat-bottomed U. The base also does not seem to be cut into chalk bedrock; this is quite surprising, especially given its greater depth than . Perhaps there is some redeposited chalk. At the very bottom of the fill, Phil found a sherd of what appears to be the shelly fabric of Grooved Ware. Chris and Jim have been drawing the section across the outer ditch, . It carries on right up to the lynchet on which the henge was constructed, which gives us a complete stratigraphic view across the monument. It also incorporates the pre-henge ditch section. There is a bit of a feeling of winding down on site, which is slightly unfortunate. There is still a lot more that could be done: excavating out the inner bank, excavating the part of the outer bank in the southern arm of the L-shaped section, looking for further pre-henge structures, excavating the remainder of fill (307)… However, tomorrow is the Open Day (and the weather is predicted to be foul) and the day after will be out last day, so there is a reason why everything now seems a bit down beat. We just need to remember what a fantastic site this is and what a good excavation this has been. Another post written by Keeley. It was very wet this morning and it looked like the rain was going to stay, a group decision was to carry on digging, we have tight time constraints and still a lot of questions to answer. But mostly be honest people were really keen of which I am really grateful as I could not resist the possibility of getting the outer ditch bottomed out and the fill of the oval cut in the centre of the henge removed. Chris and William needed little encouragement to get into the outer ditch and both worked really hard to remove the remaining contexts to expose the full profile of the ditch. It is a fantastic feat of human engineering by our ancient ancestors and now it is cleaned it looks brand new. We have taken lots of photos just before the second deluge of the day began just before lunch. Sid and Paul are continuing to remove the Neolithic top soil and are still uncovering flint and ceramic artefacts. They have removed a very shallow context (382) and are coming down to another layer. Phil and Kit are continuing work on the inner ditch and it looks like they are getting close to the bottom if the profile is the same as the section excavated last year. This area is still very full of finds and they are progressing well. Paul’s pit (389) is has a very similar and stubborn fill to the deposits in Chris’ pit lower down the slope. David has been given the task to remove this very compacted chalk deposit in the pit started by Emma last week. In the morning Ivor, Ursula and David removed the remaining compacted chalk in the structure slots and it is a clear horseshoe shape, this will be planned and photographed tomorrow but it is very interesting. In the afternoon, Ivor cleaned up the small area of burning next the inner bank which we will investigate tomorrow, and Ursula began looking at another hollow in the entrance area. Jan logged all the muddy finds today with Rick helping in the morning, in the afternoon Rick looked at a small hollow in the “L” shaped enclosure which was very shallow with very few finds. He then helped Paul draw the section of his small pit. Frankie has been under the tent today excavating the oval feature in the centre of the henge. It is full of charcoal and is thick homogenous deposit coming down to a lighter layer with a large amount of ash and small pieces of charcoal. Despite the horrible weather people were keen to carry on and after an extended lunch to shelter from the rain work continued well throughout the afternoon in good spirits. The surprise arrival of Mike Parker Pearson and Keith this afternoon added to great atmosphere on site. Mike was impressed with the henge, especially our outer ditch, even though we don’t have the “stones” he is more familiar with. He confirmed our pot is a very small collared urn. After a fairly lengthy walk around the site and a few team photos in the rain he was happy to chat with members of the group and we are looking forward to seeing him again in October. Blog post by Keeley in Keith’s absence. Weather: very warm, reaching 27° C by half three. Pauline and Sid are excavating the Neolithic topsoil (396) at the south western end of the “L” shaped area. They are finding pieces of daub, lots of flint and some pottery. They are coming down on to a deposit with larger pieces of chalk within the matrix. Kit, Emily and Phil are continuing on the inner ditch (369) which is full of finds, although they are progressing well and have a good recording system in place. Once again Kit has possibly (Keith to confirm) found a very interesting artefact, a piece of worked bone with a very pointed end which could be a pin or needle. Bernie and Frankie continued inside the inner bank to try to resolve the stratigraphy; however, it is proving very difficult to determine at present. They were joined by Jan in the afternoon to continue removing (29). A good amount of finds were recovered from this area. John and Steve are continuing Rhiannon’s pit (372) in the entrance area and it is very similar to the pit located close by, excavated by Chris last week. There have been very few finds within the deposit (376) and (381). Paul is excavating a small hollow on the northern side of the “L” shape excavation area which has very compacted chalk at the sides and base similar to Chris’ pit and the pit John and Steve are finishing today. Rick was cleaning back the area close to the area of burning at the corner of the “L” shape and confirmed that the bedrock is very irregular in this area with silted up patches which we will continue to investigate over the next couple of days. In the morning Jean and Sylvia were working on the thick deposit overlying the natural by the outer ditch, although this is very hard work and digging down slope has a vertigo effect. This is a main area to target over the next few days. Jean helped enormously this afternoon tidying up the sections and cleaning back the northern leg of the “L” shaped area in preparation for the open day. Ashley and Ivor have worked really hard today and have nearly completed excavating the slots (344) for the first structure we found on site. The sides are quite irregular but it is nearly completely excavated. Jan and Christl have been very busy today with a huge amount of finds and Tony has been extra busy but totally in control of distributing batch numbers and logging in the finds. Isobel and Priscilla have been working on the ash pile in the corner of the “L” shape at the centre of the henge. They have been carefully excavating (306) which is proving to be a very deep regular deposit of dark brown loose silty soil. There is a very large amount of carbonised wood with some very large pieces which were recovered for later analysis. It is evident that there is a small oval pit cut into the chalk, which looks like it has been filled in quickly with one deposit. We will continue to excavate this tomorrow. After five weeks on site, the story is beginning to come together in a coherent way. It’s not so much that the old story is changing as that the story is becoming more complex. This week we have discovered that the first phase of the henge is marked principally by the outer ditch (sections  and ) and the bank ((200)/(213)/(293)); it is possible that the ashy dump (305) and pit  also belong to this phase. Phase two marks the transition from circular formative henge to oval classic henge, which, it is now clear, involved more than simply digging the inner ditch: it aso led to the reduction in width of the bank on its inner edge, at least around the southern and south-western side (was this perhaps done ony on the side opposite the entrance to make the space internally oval rather than circular? ), and the material removed from it piled up inside the newly cut inner ditch to create an internal bank, (97). After the creation of the inner bank, the entire henge (including the inner edge of the inner bank) was “paved” with a chalk rich deposit, (207)/(355), that extended out through the entrance and may have formed a path or roadway leading to the henge; a square chalk platform, (88), was also constructed in the centre, more-or-less over the ash heap (305). Substantial burning, represented by deposit (29), took place on top of the inner edge of the new bank. A third phase is marked by the digging of a large posthole, , close to the centre of the henge and (perhaps) a ring of posts set into the inner bank, (97), of which the L-shaped section revealed one, . We have lost the deposits that formed the surface during this phase, so it is only the cut features that survive. Finally, pit  and cremation burial  were deposited, making a fourth and final phase of the site; both these features contain material that is so different from anything from the earlier phases, that I regard them as closure deposits. There are still elements of the story that need elucidation, not least the dates. At the moment, we are entirely dependent on the ceramics and the lithic typology, which only give vague indications of period. Nevertheless, the first phase appears to date from before about 3000 BC, possibly by some centuries. The second phase appears to pre-date the first use of Grooved Ware, so this would begin perhaps 2900 to 2800 BC; the third phase may date to a time when Peterborough type Ware was no longer current, so perhaps after 2500 BC; the final phase can be dated only by the unusual pot in pit , with its heavy collar, Beaker shape and Grooved Ware fabric, which would place it around 2200 BC. Rhiannon and Graham do seem to have found a pit or posthole close to the outside of the henge bank. It may turn out to be very similar to the scoop , west of pit . It encourages me to believe that  was indeed an artificial scoop, not a patch of natural wear. Ashley and Ivor are ready to tackle structure . I have asked them to remove a half-metre section from each terminal to define the edges of the trench at the ends of the visible element to ensure that they really are terminals and not simply places where ploughing has removed the material into which they were cut (which ought not to be an issue, as Ivor’s section was sealed beneath the bank, (213)). Chris has started the removal of (360), the topsoil deposit sealed beneath the bank at the southern end of the L-shaped section. I thought that it was likely to be only a thin deposit, but it seems to have a reasonable depth. There is a rimsherd of Peterborough type Ware (with an apparently flat rim with oblique whipped cord “maggots” beneath it, perhaps suggestive of Fengate Style), which is a good indication of the Middle Neolithic date of the first phase of the henge. There were two pebbles, both of a maroon colour, next to each other: there have been no others of this character on site, so far as I know, so they have been collected as finds. At the end of lunchtime, we had a visit by Pauline Gimson, who has not (yet) been able to come and dig. She is hoping to come along for a few days next week. Frances and Julie have been investigating (306) and, contrary to expectation, it seems to be occupying a hollow in the top of (355). This puts it firmly within the second phase of activity in the henge, which is a pity, as it means that only the outer ditch and the bank are definitely early. On the other hand, the discovery of a concentration of pre-henge finds in (360) may well help provide a good date for the start of the first phase. After five weeks, I feel that we have achieved a great deal but that there is still a lot more that could be done. Next week will prove crucial in answering the outstanding questions and also in finishing the excavation of the deposits in the L-shaped section so that we can get a complete section drawn through the henge. Rhiannon’s feature, , is beginning to look more distinctly pit like. The chalk bedrock now appears to be diving down rapidly from its natural level, just as in pit  and she has a second fill, (374). Graham has joined her in its excavation. Like  and , it is not producing finds. I’m beginning to wonder if these features have nothing to do with the henge and if they are part of the pre-henge activity Chris is uncovering in (360). Of course, the pre-henge activity might all have taken place on the very day that construction began so, although it is stratigraphically (and chronologically) distinct, it is effectively contemporary with construction (at least in a radiocarbon chronology!). It is also the case that these three cut features are in the entrance to the henge; there is no sign of similar features in places where we have removed the henge bank. There is some very fine débitage coming out from the inner ditch fill (3??). It’s from blade making, which probably puts it in the Middle rather than the Late Neolithic, when there is tendency for blades to become broader, squatter and more badly formed. Once again, this might be evidence for a date for Phase 2 before c 2800 BC. Martin has discovered a broken denticulated blade. Saturday 17 August 2013: Après le déluge, boue! The site is still a bit of a mess after yesterday’s downpour: the outer ditch and pit  still hold water, there is a silt build-up along the south-eastern (lowest) part of the main trench and a series of silt deposits marking the positions of rivulets that formed during the rain. There is no point in trying to clean up most of this, as we are due rain later today (the forecast suggests around 2 pm): the water-filled ditch and pit will have to wait for the water to drain away naturally. The one exception to the no-cleaning rule is over the first structure to be discovered: I would like to get it defined, photographed and planned today, so that excavation can begin on it tomorrow. The shape has changed yet again following further cleaning, although it still appears to be open to the east. The third structure (fill (359)) appears to be just a short stretch of visible wall foundation and I wonder if we have a different type of building here. Perhaps it is a rectangular structure rather than curving and composed of earth-fast individual planks linked by cross-beams above ground level. Keeley and Bernie are removing (355) in the centre of the henge: it clearly overlies the ash pile (306), making it clear that this is a first phase element of the monument. It is also becoming apparent that (355) rises up beneath the burnt deposit (29) (which is sealed by (321)) and overlies the inner chalk bank (97). This gives us a really good stratigraphic horizon: anything earlier than (355)—not that there are many contexts that are earlier than it—belongs potentially to the first phase of the henge. Mervyn and Laura are working on removing the last bit of (321) before starting on (29). Rhiannon and Graham are working on the last bit of (207) at the eastern end of the L-shaped section, east of pit . There are hints that there may be another feature beneath it: there is certainly a patch of darker material that (207) appears to be slumping into. We packed up after lunch, as all the weather forecasts were predicting heavy rain and I didn’t want to pack up wet things a second day running. There was a little rain on the way home, but there has not been the downpour in Hitchin that was threatened in Norton. I hope we haven’t lost an afternoon for no reason! We have another large team today, so work is continuing on all the areas we were targetting yesterday. Things are off to a good start: in the outer ditch section , Chris and William are working on (352? ), which extends part of the way up the sides of the ditch; they have started removing these parts (which, in a couple of places, have unfortunately been left looking like steps) to find that the chalk edge of the ditch lies just a few millimetres below. In removing (293) on the outer edge of the bank, Ashley and Bernie have both fould lumps of daub, perhaps significantly close to the first structure. In the inner ditch, deposit (342), which overlies both its fills and the henge bank, has almost completely gone and it will be possible to return to excavating this section. Elsewhere, eveything is progressing well; Sid has found a piece of daub in the henge bank to the south, close to the second structure to be discovered. Emma popped in to the site first thing, rather excited. She has got her A-Level grades and is off to the University of Reading to read Archaeology: congratulations! She was also pleased to have been named in the article in yesterday’s Advertiser as co-discoverer (with Kit) of the first of our Neolithic structures. The sample buckets turned up… at the (former) First Garden City Heritage Museum! This was despite a postcode and street address that clearly refer to Letchworth Museum and despite the fact that the company has twice before delivered to the correct address. Oh well, at least we now have them. The inner ditch section in the southern arm of the L-shaped section is getting sorted out. Deposit (342), the very late soil that covers the infilled ditch, was sealed by (358), the same loose chalk rubble as (196), recorded in 2012, that is clearly material derived from the henge bank. Whether it represents post-abandonment collapse or is a result of ploughing is currently impossible to say. Chris has found the outer edge of the outer ditch and it’s almost vertical with a nearly flat base. This puts me very much in mind of the Stonehenge ditch and makes me realise that we under-dug the section, , dug at Easter: it is now evident that (286), which we wrote off as over-excavation by the machine into the natural was in fact an archaeological deposit. We have a third structure, at the southern end of the L-shaped section, where Sid and Emily are digging. This feels a bit greedy! The first to be discovered is beginning to look more defined and I can persuade myself that I can see the whole thing. Each structure is beginning to look hexagonal (or similar) and only two or three metres in diameter. I am wondering if there was originally a complete ring of them, constructed where the henge bank was designed to be erected. They are puzzling and it will be interesting to find out if there is anything like it elsewhere. Keeley has reached what appears to be pre-henge topsoil under deposit (355), which probably confirms that it is the same material as (207). This means that the entire centre of the henge was “paved” at some point (and it is clearly not a primary feature, as its deposition was later than the creation of the ash heap at the centre). As we were packing up, Anne Teather and her husband, Andrew Chamberlain, turned up on site, after being delayed by motorway traffic. They seemed impressed by the site and its landscape. I feel that everything is beginning to come together on the site. The story is not only coherent, it is also significant. We have a truly remarkable site that—this year, at least—has not failed to surprise and exceed our expectations. It really does feel like a privilege to be rediscovering this ancient place that was clearly of immense importance to uncounted people over many centuries.